Q: What Are Some Interesting DUI Cases You Have Handled? One of my clients was a methamphetamine user who was in an accident and he was out of the car. He assumed they could not tell he was driving because the officer did not see him drive, whereas there were actually two other witnesses there who did talk to the officer. But, there still was a question regarding the identification of my client. So he avoided a DUI. I had a case in which a client approached a police officer with a wad of money to bail out her friend who the police had pulled over. Unfortunately it was not her friend. The cop suspected she was drunk. He told her to walk the line. She was a gymnast. She walked the line on her hands. The cop was so pissed he handcuffed her and threw her into the front seat of his police car. Big mistake! Gymnasts have strong legs. She kicked out his windshield. They beat the crap out of her at the jail. The DA was pissed but they could not prove a DUI. They never saw her drive. They only gave her 1 FST, even though she didn’t follow instructions. She did walk the line. She paid for the cop’s windshield and pled guilty to disorderly conduct. I thought it was a great result. Some people go to trial when they should not. I represented someone who was in the military. He was going to the PX in the morning, but unfortunately had some drinks the night before. He had a lot to drink, because the next morning someone saw that he was walking unsteadily. He got into his car and started driving but was pulled over. I was able to have a plea bargain on the table for a stay of adjudication but the client absolutely would not take it. I told him he would be convicted if we moved forward, but he decided he wanted to go forward. It is the client’s right to decide how they wanted to proceed (plead or go to trial) in any type of criminal case. The client has two decisions, whether to plead or go to trial, and whether or not to testify if they went to trial. Everything else is the lawyer’s responsibility such as tactics, which witnesses to put on or not put on and how to conduct cross examination. Many clients become upset at that because they feel that since it is their case, they should be able to direct how to proceed. I recently had a federal case that was a drug case instead of a DUI. The client wanted me to file certain motions and do certain things that I did not think were appropriate. He had a pretty storied criminal history, and based on that kind of criminal history, the federal court and the state would most likely sentence him to prison. Without a criminal record, he would be more likely to get probation depending on the severity of crime. I once had a case in which my client and his wife were fighting while the car was parked he was in the driver’s seat. His wife took off all of her clothes. I asked why? She said, “I always take my clothes off when I get drunk.” She became belligerent with the officer and he told her if she didn’t leave he would arrest her. She walked home Buck Naked! Another police are approached her and asked what she was doing. He drove her home, but not before he put a tarp on the back seat of his car. You just can’t make this stuff up. Q: Can A DUI Case Be Defended Without An Attorney? It would be a huge mistake to try to handle a DUI case without proper legal representation by an attorney who knew what they were doing. When clients talk to me about wanting to handle their DUI themselves, I ask them whether they would operate on themselves, because if the answer to that is no, then they should not try to handle their DUI case themselves either. Firstly, anyone should never represent themselves. There is a saying that if a lawyer represents himself he has a fool for a client. Even a DUI lawyer, who was accused of driving under the influence, should hire someone else, and that is what I would do. Thankfully, I have never been convicted of a DUI or been in that situation. It would not be a good idea to have a general lawyer, or even someone who handled criminal cases but did not do DUIs, because there may be defenses and ways to handle the case that an experienced DUI lawyer would know, whereas even an experienced criminal lawyer who did not have the expertise in a DUI case may miss. I tell my clients they should not go to a foot doctor for a heart problem, which is why they would need a specialist. Regarding hiring a PD, or public defender, the good news is that public defenders are free, although the bad news is the person would never know which public defender they would get. Some public defenders may be good whereas some may be not so good. The other reason why people really should not have a public defender handling their DUI case is because the public defender would only represent them for the criminal case, not the DMV hearing which is a a civil proceeding so the public defender would not represent them for that portion of the case. I have often seen the public defender do a great job so the client was not convicted of a DUI, but then no one went to the DMV hearing because the client did not realize the PD would not handle the DMV hearing and they needed to go. Unfortunately, they ended up with their license revoked for 90 days, which could have been avoided. The public defender could not represent him on a civil case or the DMV hearing, which is considered an administrative proceeding, not a criminal action. He did not get the opportunity to defend himself, which is why it would generally not be a good idea to have a public defender represent you in a DUI case or if they did have a public defender represent them, they could hire another experienced DUI lawyer to just handle the DMV hearing. But it is usually better to have 1 lawyer handle the entire case. Q: How Attorney Mace Yampolsky Can Help You? My experience sets my firm apart in handling DUI cases, because I have been practicing since 1981. I have handled thousands of DUIs and I have attended innumerable DUI seminars. I have actually given DUI seminars and taught other lawyers how to practice DUI defense. I handle everything when I handle a case, meaning I handle the criminal case and the DMV hearing. We charge a flat fee, so it would not matter whether we went to two, three or five court appearances or whether we plead or went to trial, it would just be a flat fee. Most criminal cases in state court have flat fees. We charge a flat fee for a first time DUI and for a second time DUI, although we would only charge a flat fee for a third time DUI through the preliminary hearing, or if the case was negotiated. We might charge a flat fee if we went to trial although sometimes we do it hourly. My hourly rate is $500 an hour, so the client would not want me to handle a case on an hourly rate because I am very thorough and it would cost them more money. A DUI lawyer who knows how to defend your rights is necessary if you have been arrested for a DUI. If you have been charged with a DUI, you could be facing some extremely severe penalties including loss of your license, fines, and jail time. 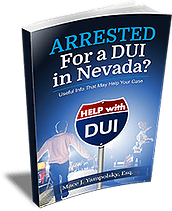 These Las Vegas DUI cases can become quite complex, and it is important to have an experienced DUI attorney on your side to help protect your interests and guide you through the process. At Mace Yampolsky & Associates, we have helped thousands of clients throughout Las Vegas who have been charged with DUI. I have more than 30 years of experience in these cases, and I know what it takes to build a successful defense on your behalf. When a law enforcement official stops you on suspicion of drunk driving, the law dictates specific rules that must be followed leading up to and during the stop. Any violation of these procedures can constitute a violation of your rights, which can seriously weaken the prosecution’s case against you. Q: How Does Blood Alcohol Level Affect DUI Cases? 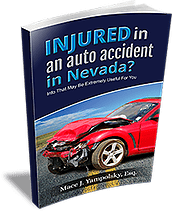 In Nevada the legal limit is a 0.08, so someone who the police can prove was driving or in actual physical control whose blood alcohol concentration was over a 0.08 could be convicted of a DU. However, the breath test has an error factor of up to 10%, meaning it could be 10% higher, or 10% lower. So if someone is a .09 or less, we would use that in our argument that the prosecution would not be able to prove that the blood alcohol level was 0.8 or more beyond a reasonable doubt. This is a very high standard that is used in all criminal cases. We would typically resolve this kind of case as a stay of adjudication. The client would actually plead guilty to a DUI, but the court would “stay the adjudication”. The guilty plea would NOT be entered into the record. So if anyone checks, your case would still be pending. Then you would need to complete certain requirements; usually attend and complete a DUI school, attend a Victim Impact Panel (VIP) which is basically a seminar in which people tell you how their life has been adversely affected by a drunk driver (i.e. My sister was rear ended by a drunk drive and she broke her arm), pay a fine, stay out of trouble and possibly do some community service. If you successfully complete these requirements your case would end up as reckless driving. This is NOT a DUI conviction. But the flip side is, if you do not successfully complete, you will be convicted of a DUI. If a client took a blood test and the blood alcohol level was 0.085, then he or she could have the blood retested because it sometimes might come back lower. Some clients have a much higher blood alcohol level. According to Nevada law, if the blood alcohol level was in fact over a 0.18, then in addition to the other penalties we would need to get a chemical dependency assessment. The person would be interviewed by a psychologist to determine whether or not the person had an alcohol problem or what other requirements they may need as part of their sentencing. They would typically want people to go to AA once a week or maybe even twice a week depending on the blood alcohol level and the history of the individual’s driving record and previous incidents involving alcohol. The chemical test for alcohol would need to be done within two hours from the time of driving. The alcohol test would not be admissible in court if it was not done within those two hours. The 2 hour time limit does not apply to drugs. I handled a case involving a motorcycle in which my client actually came back to the scene of the accident because his friend wiped out on his motorcycle. When the officer arrived, my client was standing with his motorcycle. He was not driving and by the time they took the blood alcohol level it had been over two hours. There was another witness for this incident, who had seen both motorcycles. She said the other motorcyclist passed unsafely, whereas my client did not. I asked whether there had been any bad driving by my client, and she said no. They were not able to convict my client of a DUI because the blood alcohol level was not admissible because it was taken more than 2 hours from driving. I went to trial on this. I spoke to the officer ahead of time and told them they would not be able to prove their case. All I wanted was for the DA to reduce it to a reckless driving conviction. The cop would not agree. So we went to trial and I won. Q: What Happens During The Standardized Field Sobriety Tests? Roadside tests are also known as “field sobriety tests” FSTs. I call them roadside tests because they are generally taken on the road side and most people may not understand the term field sobriety test. Three tests are usually given. The first test would be the horizontal gaze nystagmus test abbreviated as HGN. In this test the officer would stand in front of the client and move his finger or a pen from right to left in front of the client’s eyes to a distance of about two feet each way. The person would be instructed to follow the finger with their eyes without turning their head. In this test, the officer would be looking for nystagmus, which is an involuntary jerking of the eye. It would be an evidence of nystagmus if the person followed the officer’s finger and their eye jerked prior to the officer stopping his finger. That would be considered evidence that the person was under the influence. It would also be considered nystagmus if the person had involuntary jerking of their eyes prior to fortyfive degrees. How The Breath Test Can Overrule Other Field Sobriety Tests? The officers would probably have a portable breath tester (PBT) with them, so the person could blow into it and it would show a reading of their blood alcohol level. The actual reading itself would not be admissible in court, but it would be a factor in determining whether there was probable cause to arrest them. The officer would sometimes feel the person did okay on the field sobriety test, but then they would give the portable breath test which would come back over a .08 so they would decide to arrest the person based on that. There is no requirement that you need to take a PBT at the scene. Whatever the person does, they should not consent to any roadside tests. The law in Nevada used to state there was no right to refuse, so if the person refused to take the test, a group of officers would hold them down and take a blood sample whether they liked it or not. But now you can insist that the police get a warrant.